If you're new to the sport then you've probably realised how hard it is to find good detailed paramotor reviews and comparisons. Every pilot tells you they're flying the best machine, and every manufacturer claims to have the best, so how to you know which to choose? It's simple... you don't! I played my part last year, by putting up an honest review of my current paramotor after flying it for 100 hours, and you can read that HERE. But in this post I'm going to choose 5 of the most popular paramotors, and run a comparison of each to help you choose one. The Maverick is the latest offering from Parajet, and it's quickly become one of the most popular paramotors to see at the field. With its lightweight design, and uniquely styled polygonal fuel tank, it's a real head turner; but what does it have to offer? Let's take a closer look. Parajet have dropped their regular aerofoil shaped frame and cage, and used a tubular design constructed completely from titanium. Although it looks flimsy when you stand it next to one of their V3 models, it's actually incredibly rigid. This lightweight frame and cage design gives the standard Maverick a dry weight of just 24.5 KG, when fitted with the Vittorazi Moster 185 Plus engine, a carbon Helix prop, and a Dudek lightweight harness. The weight of the Maverick can be decreased further by choosing the sport, or pro versions, or by choosing a different engine. Parajet are offering a selection of lightweight engines including the Atom 80, which is also from Vittorazi, the popular EOS 100, and the EOS 150. The EOS 100, and the Moster 185 both made my top 5 engine list that you can see HERE. The Maverick has a fuel tank capacity of 10 litres, which will give you 2.5 hours of flight time with the Moster 185 engine. For this reason, cross country pilots may prefer one of the smaller engines to lower the fuel consumption. I already mentioned the unique styling, but the polygonal fuel tank has more to offer than just great looks. The tip of the side polygon actually points to the 4 litre mark. This makes it much easier to gauge how much fuel is left mid flight, to minimize guess work. Transportability: Parajet have focused on making the Maverick very transportable, but at the same time quick easy to assemble at the field. Eight titanium tubes quickly slot together with Parajets trademark nylon plug and play system, and just as easily break back down when you're finished flying. Snap fit netting: the new snap fit netting makes fitting the netting very quick and simple, leaving a snag free surface around the cage hoop. This keeps your lines happy, and it also looks great. Replaceable cage: due to its modular construction, if you happen to fall over and bend a section of the cage, all of the components can be replaced individually. Ready to travel: if you purchase the sport or pro version, you will receive a travel case that is designed to fall within the standard airline 25 kg limits. I wouldn't say the Maverick is aimed at complete beginners due to its lightweight design. Although it is strong, when you loose weight you unavoidably loose strength. So beginners who are likely to have a few falls may wish to choose the super tough V3 from Parajet, or one of the others in this list. If you're comfortable with launching and landing, and you want a lightweight paramotor with the added bonus of excellent after sales service from Parajet, then this could be the one! Buy your Parajet Maverick HERE. Air Conception took the paramotor market by storm a few years back, by producing one of the lightest paramotors in the game. The Magnesium Delta frame weighs just 2 KG, while the titanium Race V2 frame pictured above weighs a mere 2.5 KG. Let's look at some of its stand out features. Air conception offer 2 main frame options: the magnesium Delta, and the titanium race V2. These are both extremely light, and come with various cage sizes to accept different propeller options, including 140 CM, 150 CM, and 165 CM cage hoops. Air Conception also offer the titanium Race V2 as a split frame design. This means you can remove the bottom half of the frame, along with the fuel tank to increase transportability. 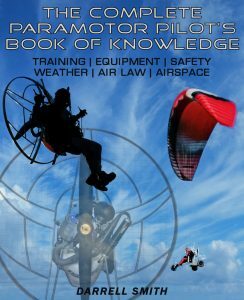 This is especially useful if you wish to travel with your paramotor by plane. On all frame options the cage is easily removable for transport, breaking down into 4 hoop sections, with 6 separate carbon fibre rods. The mesh remains attached, meaning that if you fall and bend a section, replacement is slightly harder than some other paramotors on the market. 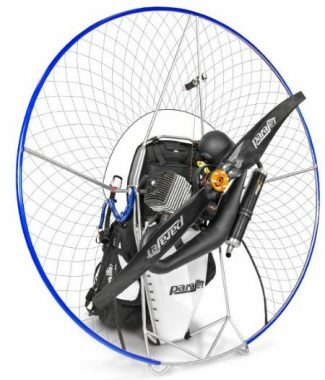 When you buy an Air Conception paramotor you'll have 2 engine options: The Nitro 200, or the Tornado 280. These are available with many different options as listed below. Since their introduction, both the Nitro and the Tornado engines have proven themselves very reliable, with pilots reporting no issues way past the 100 hour mark. Both of these engines are capable of lifting the heavier pilots, with the Nitro offering 75 KG of thrust from a 130 cm prop, and the Tornado putting out 80 KG of thrust from a 125 cm prop. As a complete unit, the Magnesium Delta frame equipped with the nitro 200 pull start engine, weighs in at just 19 KG! This makes it one of the lightest paramotors on the market, and it's been one of their biggest selling points. If you'd rather the titanium Race V2 frame, don't worry as it's only a fraction heavier, weighing it at 19.5 KG with the same engine. Various fuel tank options: choices include 9 litre, 11.5 litre, and a 15 litre fuel tanks. Low fuel consumption: the nitro 200 burns just 2.66 litres of fuel per hour at the typical cruise RPM. This means a 15 litre fuel tank will give you over 5.5 hours of flight time. The weight of a paramotor can be the decider for many pilots. Those with back or knee troubles simply can't handle a heavier machine, especially with the added weight of fuel. 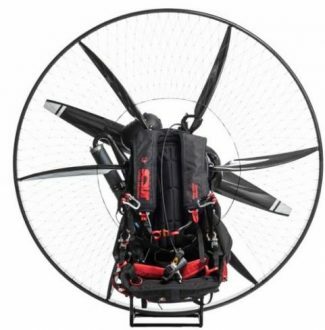 This makes the Air Conception the perfect choice for those who need a lighter paramotor. Air conception also offer a 2 year parts warranty for added peace of mind in your investment. Prices start at around £5250 / $6950 depending on the dealer you choose. Hailing from Slovakia, Scout have produced a paramotor with a totally unique carbon design. This popular machine has some important safety features and world firsts; and it's probably the best looking paramotor on the market! But is it really as good as it looks? let's get a closer look. Scout currently offer two versions of this paramotor: the carbon, or the enduro. On both versions, the frame is made entirely from aluminium. The words carbon and enduro relate to the cage and its spars. On the carbon model, the whole cage hoop and spars are constructed from carbon fibre, this makes it the lighter of the two at just 24 KG when fitted with a Vittorazi Moster 185 engine. The enduro model has an aluminium cage hoop and spars, meaning it may be a better choice for pilots who are more likely to fall over. Carbon fibre has the potential to crack during a bad landing, aluminium can simply be bent back into shape. This means the enduro frame is probably the better choice for a beginner pilot. The Moster 185 has been a popular choice for Scout pilots, but you can also choose from a selection of smaller, and even bigger engines when you buy a Scout. These include the reliable Top 80, and the super lightweight EOS 100. Or if you need even more power than the Moster has to give, you might choose the super powerful Polini Thor 250, or the 235 cc Cors-Air Black Bull. One of the first things you notice about the Scout is its large carbon spars. If you look closer you'll see that each of these 6 spars are shaped like an aerofoil, and this is the Scouts secret weapon against torque. As you move forward, air passes over the aerofoils creating lift just like a wing. 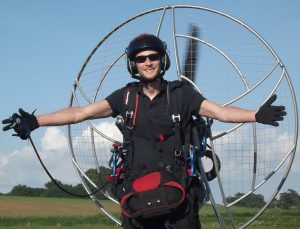 As the torque of the engine tries to twist the paramotor in one direction, the lift generated by air passing over the spars twists it back in the other direction to keep it flying straight. This works in unison with the RPM of the engine. As you pull the throttle you create more torque, but you also speed up the propeller, which pulls even more air past the spars to further lessen the torque effect. SafeStart: is a device that controls the RPM of the engine during startup, to reduce the risk of spontaneous revving, and ultimately devastating propeller injuries. This was one of the reasons I chose the Scout as the safest paramotor, and you can read more about it in THIS POST. Load testing: most manufacturers test their paramotors with some high-G manoeuvres, but Scout go the extra step and test their harness to a massive 15 G with certification. They also load test the frame to over 2 tons for your peace of mind. Adjustable pitch propeller: this lets you adjust your propeller´s pitch between 10 and 13 degrees. A lower angle gives maximum performance and acceleration, and a higher angle gives a better cruising RPM for cross country flights. With so many great features, and a range of optional extras, the Scout will suit pilots that want a good all rounder. Although experienced pilots say it's easier to land than any other paramotor they've flown, beginners may want to avoid the full carbon cage, as a fall could easily cause some expensive damage. Expect the enduro model to weigh 26.7 KG, which is 2.7 KG more than the carbon cage. Prices start at £6420 / $8510 for the Scout Carbon with a standard Moster 185 engine. Or £5520 / $7320 for the Scout Enduro with a standard Moster 185 engine. Find a Scout dealer HERE. Bailey are well known for their performance motorsport parts, and for the 4-stroke V5 engine that comes as an option with many different paramotors. But Bailey also make a frame that's designed around this engine, known as the V5 paramotor. Let's see what it's got to offer. 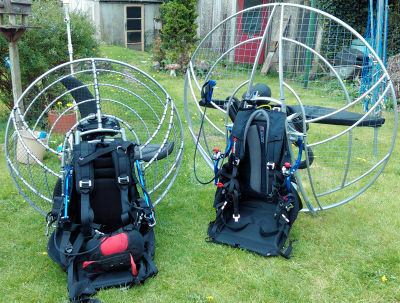 When designing the V3, one of the goals was to make the paramotor easily transportable, but still quick and easy to assemble. Made from aircraft grade aluminium, the cage hoop consists of four anodised sections that use alloy inserts to keep it in place. The cage netting is held in place by fastening loops, which make damaged netting very easy to replace. Rather than replacing the whole net, single lines can simply be threaded back through the loops. The main frame and chassis is also made from aluminium, and has been designed to give maximum structural stiffness, without adding excess weight. 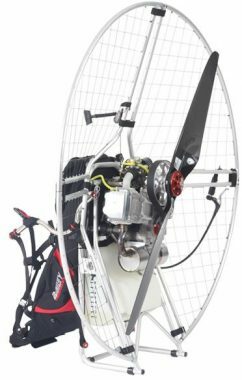 The Bailey V5 has been the only 4-stroke paramotor engine worth having for many years now. It weighs 15.8 KG, which is incredibly light for a 4-stroke, especially when you compare it to the Moster 185 2-stroke which weighs 14.2 KG. If this extra 1.6 KG bothers you, remember that a 4-stroke will burn much less fuel. The fuel consumption is just 2.1-3.0 Litres of fuel per hour, so for every hour spent flying, you'll be able to add at least 1 litre of fuel less than you would with a Moster 185, thus saving weight. The V5's polished stainless steel hang bars have been designed for optimal placement, keeping the pivot points directly along the thrust line, and vertically in line with the chassis/engine's centre of gravity. This keeps the V5 vertically stable during power changes, and almost totally eliminates torque steer. Weight shift: due to its optimal pivot placement, weight shift turns can even be done opposite to the direction of torque under full power. This makes the V5 attractive to cross country pilots who enjoy flying hands off. Flight time: due to its low fuel consumption, a full tank of fuel (11.5 litres) can give a flight time of up to 5 hours! Thrust and power: the 195 cc 4-stroke V5 puts out 20.5 horsepower, and produces 60 KG of thrust. Many people are put off by the weight of a 4-stroke. But the V5 has an all-up dry weight of 27.5 KG, so although it's a 4-stroke it's still no heavier than the bigger 2-stroke machines. This machine will suit pilots looking for a quieter, smoother running engine, and it's been especially popular with cross country pilots. Miniplane have been building paramotors for over 30 years! Their goal is to build reliable, lightweight, and affordable machines, and the ABM is all three. Let's see if this is the one for you. Building a lightweight paramotor is tricky, because you inevitably loose strength. Many manufacturers tackle this problem by using stronger materials like titanium, but then you add to the price tag. To keep the ABM lightweight and cheap, Miniplane have used aluminium for the main frame and chassis, fibreglass rods for the outer hoop, and carbon fibre spars. 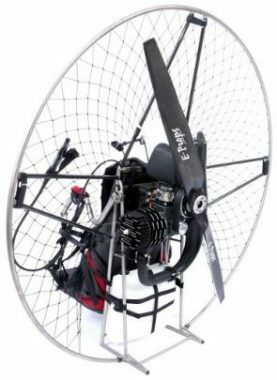 Miniplane use their own popular Top 80 engine in all of their paramotors. This engine has been powering paramotors since the first miniplane was built back in 1989. It's proven itself to be very reliable, with easy maintenance, and readily available parts. It's not an engine for the bigger guys, but Miniplane have recently started offering the ABM with bigger engines. Pilots over 190 lbs should request a larger engine by contacting their dealer. 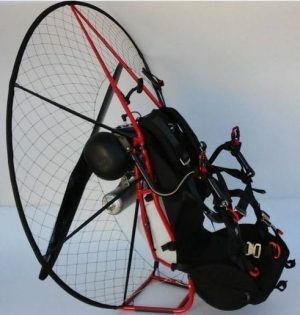 As previously mentioned, Miniplane have tried to make this paramotor as lightweight as possible. Fitted with the Top 80 engine, the all up dry weight is just 20.55 KG, which makes it one of the lightest paramotors on the market. Weightshift: Like all of the other paramotors in this list, the Miniplane ABM features weightshift abilities. But it's worth mentioning this because Miniplane were the inventors of the weight shift paramotor. Transportable: the Miniplane's cage breaks down for transport, and the bottom of the frame below the tank is also removable, so you can fit it into even tighter spaces. Repairable: the frame and cage are very easy to repair if damaged. The cage is completely modular, meaning direct replacement parts can be bought from Miniplane. And as the bottom of the frame is removable, a damaged frame from a hard bum landing can also be repaired very easily. The miniplane will suit pilots on a tighter budget, or those who want a simpler design. It's also a great choice for smaller pilots, or those who struggle to lift the heavier machines. If you are new to paramotoring, and you really don't know which paramotor to choose, you can learn how to choose the correct paramotor for yourself HERE. Hi, thanks for all the great information! Do you have any comments about Fresh Breeze paramotors? There seems to be lots of different opinions about them. And I am confused, are they crap or the greatest? Hi Elias, unfortunately I can’t really help as I don’t have any experience with Fresh Breeze. Their trikes seem to be very popular and of good quality, and I see the UK dealer flying them and clocking up more hours than anyone I know. I’ll leave your comment here and hopefully one of my readers might be able to help you a bit more. Thanks for checking out the site!